1. Provisional designation. This requires one complete coding region sequence to be obtained, the demonstration of a separate grouping from other genotypes by phylogenetic analysis, and an absence of recombination. 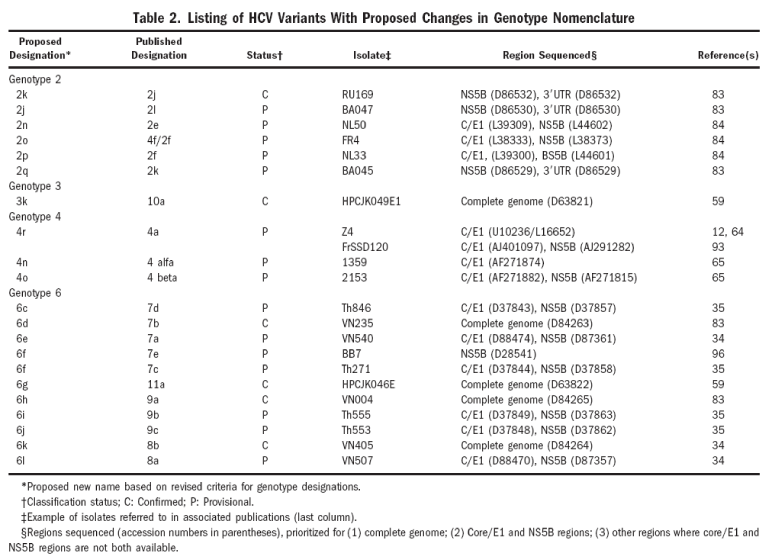 The sequence of a candidate new genotype should be independently analyzed by submission to one of the HCV databases. The sequence will be analyzed by a variety of phylogenetic methods described previously. This will allow the sequence to be assigned with the next available genotype number, and the subtype designation "a", for example, genotype 7a. 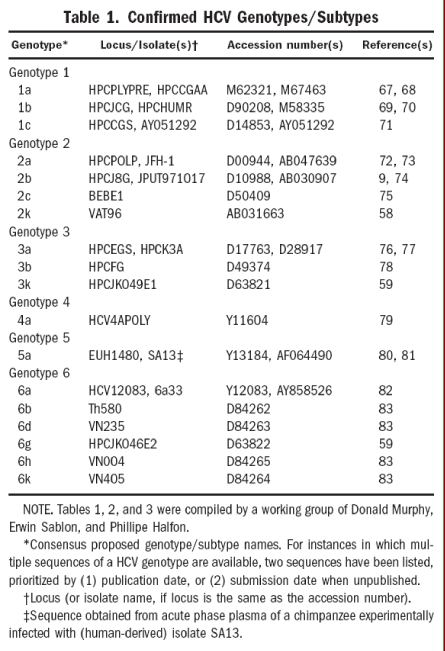 See Table 1 for a list of confirmed genotypes and reference sequences. 2. Confirmed designation. This requires coding sequences of 2 or more HCV variants from infections that are not directly linked epidemiologically. The sequences should further demonstrate a lack of grouping with current classified genotypes by the above methods. This further analysis, and any available sequences from subgenomic regions such as core/E1 and NS5B (see later discussion), will provide valuable reference information on the genetic heterogeneity within the newly designated genotype, the existence of subtypes, the geographical origins of the variants, and their likely designation in 5' UTR-based genotyping assays. 1. Provisional designation. Three or more examples of infection with a new proposed subtype are required for subtype designation. Sequences are required from both the core/E1 region (sequence data available from 90% or more nucleotides corresponding to positions 869 to 1292 in the H77 reference sequences, accession number AF009606) and the NS5B region (data from 90% or more positions in the region 8276-8615 in H77). The sequences of primers suitable for amplification of these regions from a wide range of HCV genotypes will be made available on the public databases. Sequences will be analyzed by a variety of distance based, parsimony, and maximum likelihood methods, and evidence sought for consistent phylogenetic grouping together and distinctness from other subtypes. Because currently classified subtypes of HCV differ in nucleotide sequence from each other by more than 15%, at least this level of divergence will be expected from other HCV variants within the genotype. However, as described in the Introduction, the existence of separately identifiable subtypes is primarily an epidemiological phenomenon associated with its recent spread. Because subtype designations are primarily epidemiological labels, it is clearly not appropriate or of value to develop formal criteria for their assignment. Indeed, the varying degrees of sequence divergence of variants within different genotypes would make the development of such criteria extremely difficult. Candidate subtypes will be provisionally assigned with the next available subtype letter for the genotype on submission to one of the HCV databases. Sequences from the 5' UTR will be of value for assessment of their appearance in commonly used genotyping assays but are not required. Single or pairs of variants of HCV that would otherwise be designated as new subtypes by these criteria will not be assigned a subtype letter in the database. 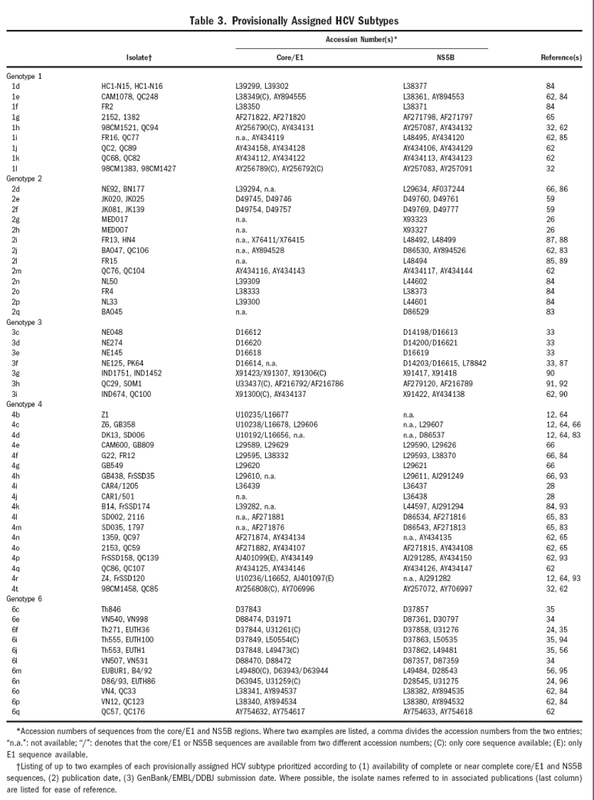 The tables below are derived from the publication and show confirmed and provisional geno/subtypes (as of August 2005) and changes made to existing geno/subtype names.